TECHZONE: Dual booter ViewPad 10 with new Android 2.2 upgrade. Dual booter ViewPad 10 with new Android 2.2 upgrade. With Android 2.2 froyo OS ViewPad 10 supply you an updated Gmail, Calendar, Google Maps, Gallery, and YouTube apps, a refined onscreen keyboard, compatabilty with newer applications, and a healthy dose of sorely needed eye candy. It is comming under two catogeries : Windows 7 Home Premium with 16GB of flash storage for $599 or one with Win 7 Professional with 32GB of space for $679.Lets look into some more features. 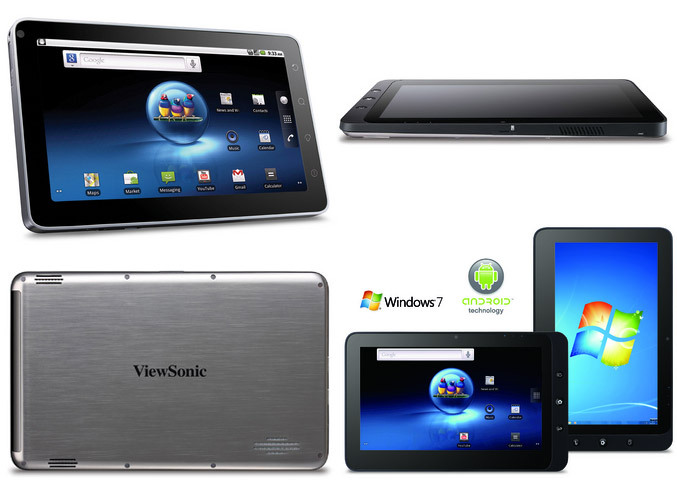 The ViewSonic Dual OS Tablet ViewPad 10 comes with a 10-in. display with 1024 x 600 resolution. It is powered by a 1.6GHz Intel Atom N455 single-core processor and 2GB of DDR3 RAM. On the top there is a 1.3 MP camera.Other features includes a microSD card slot, a pair of USB ports. a microUSB port for connecting to a monitor.Connectivity is supplied by 802.11b/g/n Wi-Fi and Bluetooth. The system's 3,200-milliamp battery was able to play videos from a microSD card for 4 hours 7 minutes in Windows mode and for 3 hours 57 minutes in Android. Tags:ViewSonic Dual OS Tablet, ViewPad 10 with Android 2.2, ViewPad 10 features, ViewPad 10 specifications, ViewPad 10 review, ViewPad 10 price, ViewPad 10 with Windows 7 Home Premium, ViewPad 10 with Windows 7 Home Professional.